DAY 24 - 30DaysOfAvoToast: Farmside Friday - AvoSeedo - Grow your own Avocado Tree! Fresh artichokes are super yummy and are a great snack in front of the TV instead of chips 😉 Poached eggs make every meal look fancy or even more if you belong to the #yolkporn people out there. We included links to really good step-by-step instructions of the two cooking methods. Let us know how it went once you give it a try! Prepare and cook the artichoke. I always just cut off a little bit of the artichoke outside and boil it together with some lemon for 40 minutes and eat my way down to the heart. Here is a really good link which explains everything step by step. Or you can be a cheater and buy the hearts prepared 😉 . Crack egg into a small bowl. Create a little whirlpool in the pan and slowly tip the egg into the water. I always put it in the middle of the pan. After 3-4 minutes remove with slotted spoon and let drain on some kitchen paper. Follow this link for a detailed description. In the meantime cut the artichoke heart into small pieces. Mash avocado with artichoke chunks. 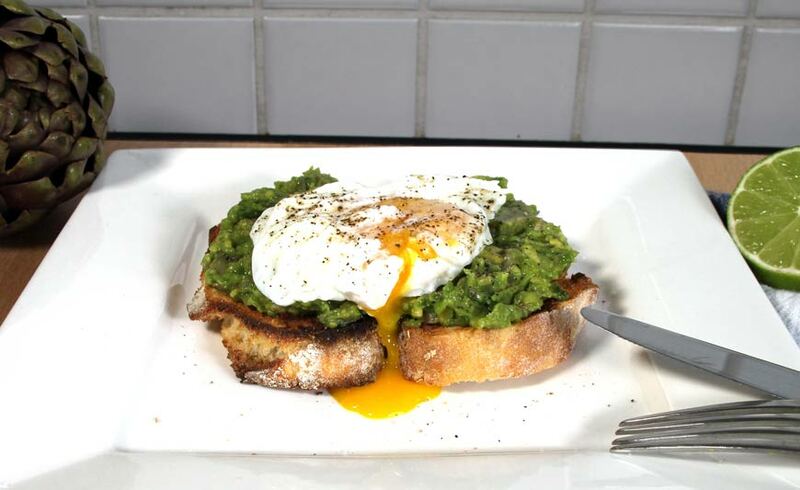 Put avocado-artichoke mixture on toasted bread and put poached egg on top. Season with salt and pepper. This entry was posted in Recipes and tagged 30daysofavotoast, artichoke, Avocado, avocado toast, avotoast, poached egg, yolk, yolkporn.